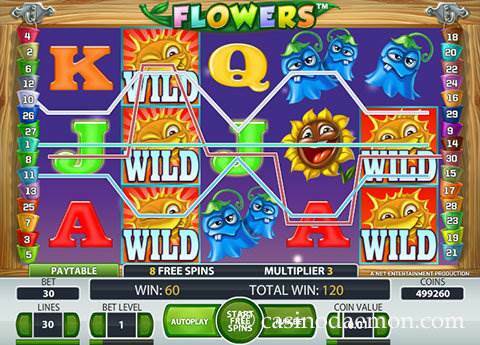 Flowers Christmas Edition is a slot from Netent that is similar to the original Flowers game, but in a wintery style with a snowy landscape and more festive symbols. The flowers are snowed in and the other symbols are Christmas gingerbreads. The symbols show funny looking flowers, each with its own personality and a snowflake, which is also the symbol with the highest combination. The variance of the game is medium, which means that you should win money regularly, but it is more smaller amounts than larger. However, due to the double symbols it is possible to get symbol combinations of up to 10 symbols on a pay-line which makes it a very lucrative game, but it is not easy to get a combination like that. The theoretical return to player is 96.3%, which is fairly average for an online slot. You can also play Flowers Christmas Edition mobile on many different devices, as the game is optimised for mobile iOS and Android devices and part of the Netent Touch series. 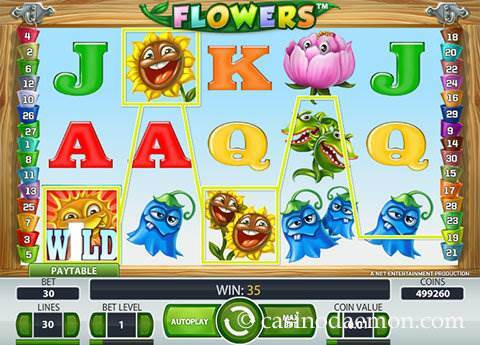 You can play Flowers Christmas Edition for free here or play the game for real money in one of the online casinos listed on this page. The special feature of the slot are the double symbols, which means that on each symbol space a flower or free spin symbol can also appear as a double symbol. The symbols for the lower paying combinations are always single symbols. 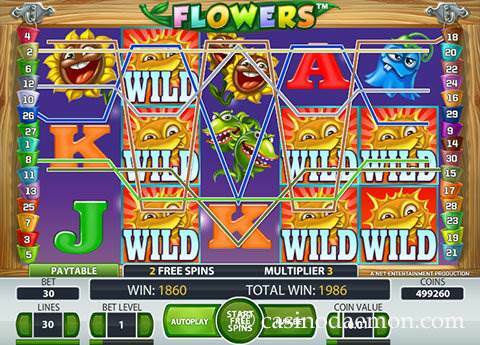 The double symbols can create symbol combinations of up to 10 symbols on a pay-line resulting in huge wins! The free spins trigger with at least 4 free spin symbols. You can get an instant win and start up to 30 free spins with tripled winnings. The game also has a special wild symbol that replaces other symbols for winning combinations and also appears as a stacked symbol during the free spins. The wild doesn't replace the scatter or stands in as double symbols. 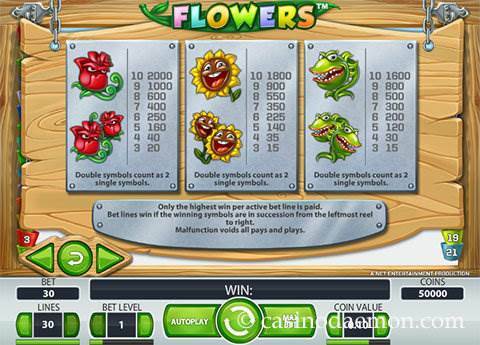 Flowers Christmas Edition from Netent has 30 fixed pay-lines that are played with 30 coins. You can select from coin values of between 0.01 and 0.50 €/£/$ and play up to 5 coins per line. The minimum stake is 0.30 €/£/$ and the maximum you can bet in one spin is 75 €/£/$.